Commonly known by plant lovers as a Split-Leaf Philodendron and Swiss cheese plant, it grows naturally in the tropical forests from southern Mexico to Panama. 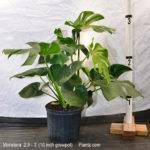 “Monstera” for its ability to get really big by vining up trees and “Delisiosa” for its tasty fruit, your houseplant version will do neither – it won’t grow up your walls or produce fruit in your home. You can, however, manually attach it to virtually anything and it will grow “up”; or it is happy to maintain itself as a floor plant without any support provided you trim it. Its deep-green, heart-shaped leaves offer years of interest accenting some larger furnishings. It can do its thing in relatively low light, but prefers some filtered sunlight from a nearby window. 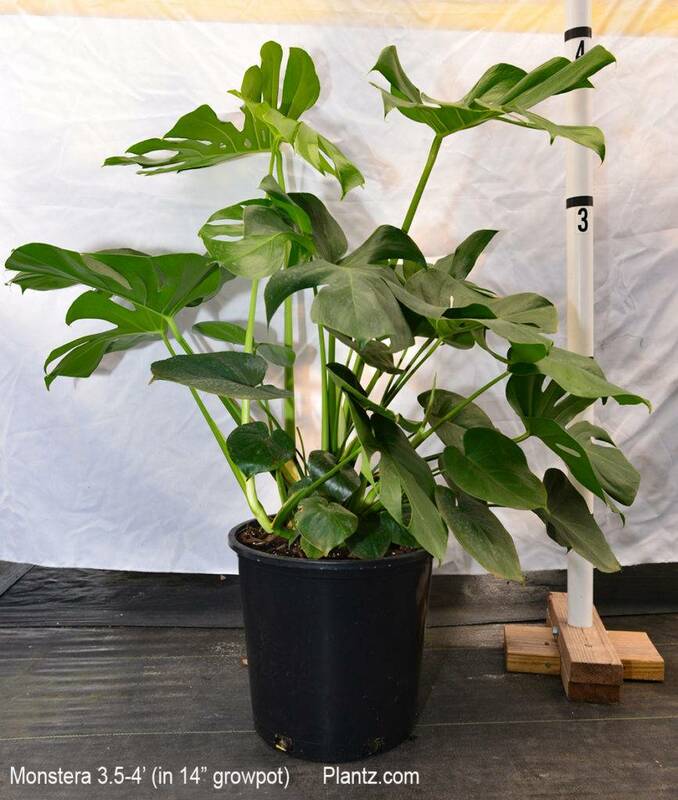 Check out this video to learn more about the Monstera from our plant specialists. This plant is a moderate drinker and can handle moist soil conditions (like it does in the forests of Panama). It can, however, go for 2+ weeks without watering with the proper sub-irrigation system, but we suggest you check it weekly during the first 6-8 weeks after you get it and during hot summer months. See our watering guide for more information. Monsteras thrive in medium to bright light, where the leaves will develop their characteristic heart shape and deep splits. It can be sustained in low-light conditions, but it won’t do its leaf-split thing without good light. Your best placement is near a window where the plant can get some sun light – east-, south- and west-facing windows are best. Maintained as a floor plant (not allowing it to climb), it can easily be moved to and from a good light source. Monsteras likely will not need to be fed during the first 6 months after it has shipped. During this time, it will use the residual nutrients from nursery production. After 12 months, it can be fed quarterly with a complete fertilizer formulated for interior plants. If your Monstera is positioned on a porch in the south, it may need supplemental nutrition sooner than 12 months. Please refer to our nutrient guide for details. Like its big-leaf friend the Ficus Lyrata, its large leaves are easy to clean and, overall, there are fewer leaves than many other interior plants. Simply wiping the leaves with a wet cloth usually does the trick. For spots where something else (besides dust) has landed on your plant, use a mild soapy solution to wet the cloth; then wipe. Well…here, it depends on what you want. The plant can be trained to climb or be maintained as a “floor” plant keeping its stems from growing long and within the bounds of the planter. For climbing, it will use its aerial roots to cling to many surfaces, but a pieces of wood or sphagnum moss pole works best. Just direct the stems to the target surface, give it plenty of light, and let it grow. Alternatively, you can prune the stems back to the base and the plant will produce more leaves at the center of the plant. Hardly a worry here, the Monstera is not a big target for pests. Scale, mealy bugs, and mites sometimes jump on, but they’re easily controlled by wiping the infested area with a soapy solution. It can take several intermittent cleanings to rid the plant of the pests. The leaves and stems of the Monstera are toxic to animals (including humans), so do not ingest any part of the plant. So, if you have a dog, cat, or horse, don’t let them ingest it. The Monstera is one of three plants that I ordered from Plantz. It arrived in near-perfect condition (a couple leaves were broken in transit-one fell off and the other is recovering). Other than the two damaged leaves it looks just like the online picture. Actually, I think mine is fuller and more beautiful than the pictured Monstera. Will Stone, Greenhouse, and Sue Waltzer, customer service, have helped me from my pre-order decision-making through the ordering, unboxing and setting up. They are the greatest! I would recommend Plantz and Plantz personnel to everyone! I’m very impressed with how well packaged the plant was for shipping. It arrived in great shape and is a nice mature plant. Would order again from Plantz. Exceeded my expectations! Beautiful, healthy plant. Absolutely the BEST customer service that I’ve ever experienced and gorgeous plant, I will order from them again!